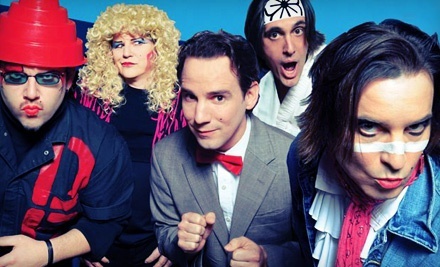 The Molly Ringwalds are the world's greatest 80s cover band. NATCHITOCHES – All Northwestern State University Demon fans are invited to the Demons Come Out at Night Pep Rally and Molly Ringwalds concert Thursday, Sept. 14. The two events are part of a week of activities commemorating the investiture of Dr. Chris Maggio as president of the university. Events are free and open to the public. The Demons Come Out at Night Pep Rally will take place at the Tailgate Field and Collins Pavilion beginning at 7:30 p.m. with students, student-athletes, coaches, spirit groups and the NSU Pep Band there to rally Demon fans for the season’s first home football game, set for Saturday, Sept. 16. The Molly Ringwalds will perform from 8-10 p.m.
“To recognize Dr. Maggio as a student of the 80s, we wanted to plan a tribute to the music, the fashion and the hair of the decade and we are hoping the Molly Ringwalds will bring back fun memories for a lot of our loyal alumni and friends,” Erikson said. For more information on the pep rally and events surrounding the Investiture, visit nsula.edu/investiture.